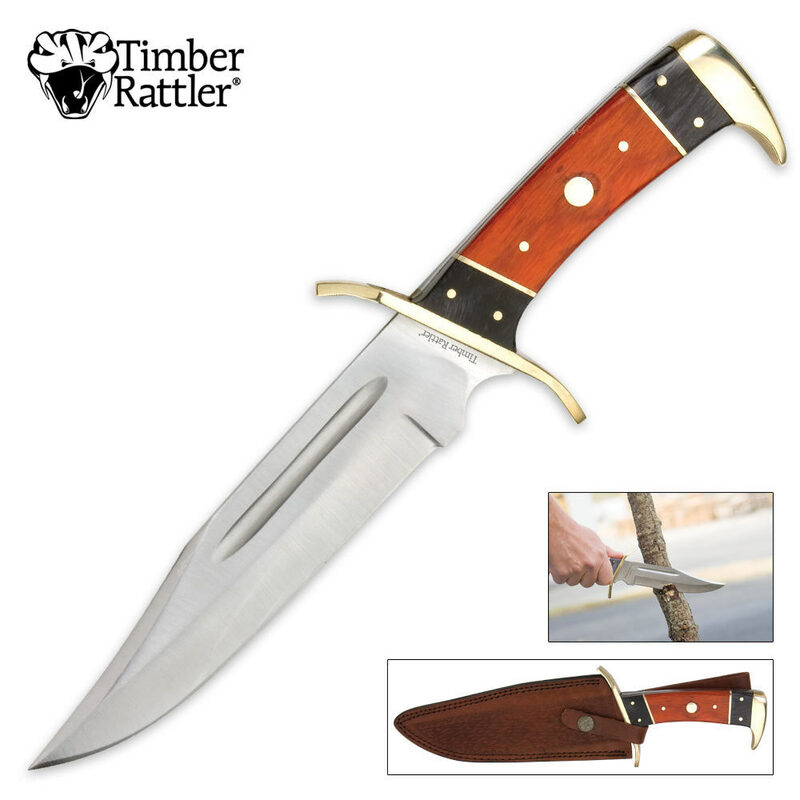 Timber Rattler 12 Inch Dark Pakka Bowie Knife | BUDK.com - Knives & Swords At The Lowest Prices! Best BudK purchase I've made so far.Quality is well above it's price point I thought the Western Outlaw was good but this is even better! nicer fit to the sheath and the sharpest edge out of the box that I've received yet. 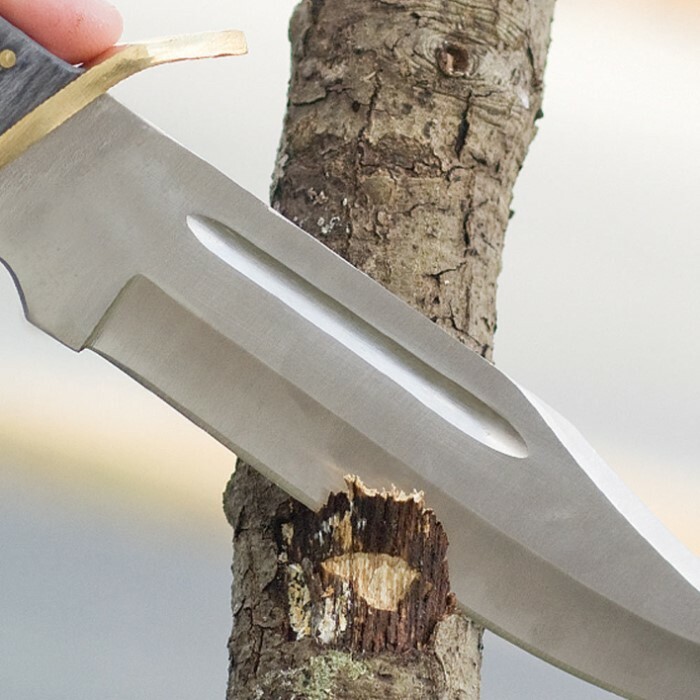 I like my big Bowies or machete if I'm going to be clearing a lot of brush or camping but this is perfect for little chores around the property. 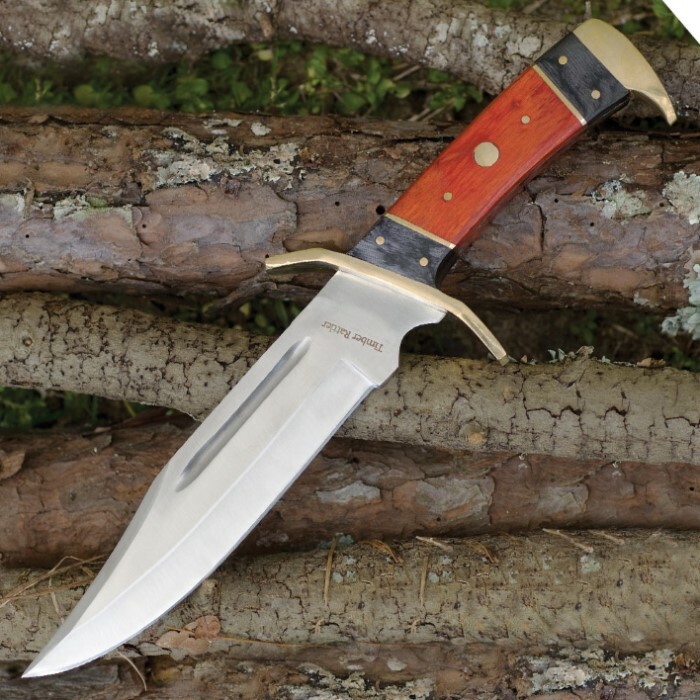 Get 1 or 2 of these when they are in stock.You won't be disappointment..........unless you're used to getting multi-hundred dollar high cost steel custom knives. This knife is a bargain. The one I received has been put through some hard use and stood up admirably. I would recommend this knife any day of the week. Frankly it performs at a level I didn't expect for the price point. It holds an edge well, it batons reasonably, and processes wood like a champ. The only drawback is the sheath, but with a little work you can redeem it. If you are looking for a large knife that will do work then buy this knife! Bud K's service was great. I got it a day sooner than expected. Others have said their's wasn't so sharp. Right out of the box, mine shaved the hair from the bacl of my arm. It fit the sheath just fine. The more I handle this knife, the more I love it. Not too small and not too big. It's well balanced and light, so it would make a good self-defense knofe, but it also makes a good utility knife, and it looks great, Time will tell about long term durability, but the product is off to a good start. I'm very pleased. This is a good knife, maybe a great knife. About the average size you want and quite nice. Mine has a few flaws, some nick at the end of the blade on the edge itself, the stamping has some smoothed patches (although really the stamping doesn't matter) and the handle has some noticeable unevenness with the gold band placement. None of these really impact the use of the knife, of which I think will be quite good. i can't wait to test it out and I might buy some extra if I come across some spare cash as it is really nice. PROS: quality, looks , hand made unique,balance,toughness almost unbreakable. CONS: Tiny imperfections because hand made but dosnt reduce quality of the knife. And it comes pretty unsharp but its very easy to sharpen and hold an edge Its a smaller version of the western outlaw bowie. I ordered 2 and was very impressed. Note these are HAND MADE so every knife is differant. Thats actually what i love about timber rattler. I ordered this knife as a " throw in" item when I bought several knives,simply because I didn't have this one. This knife is better than I thought it would be,although it's what I classify as a"slab knife"due to its"flat"handle. It's not a five star knife,but it is sturdy and dependable. Are you kidding me? Full tang, decent leather sheath, and came pretty darn sharp. You can't go wrong by grabbing a few, you will definitely be gifting these. Threw a paracord wrap on it and ready for the next Camping trip. The last 4 months of my life have been AWFUL, .. purchasing this was the true bright spot for me. This knife is Beautiful, Solid, Full Tang, Awesome, quite simply the best purchase for the money i've EVER spent from this knife site. And the sheath, i'm not sure what some are talking about dissing on the sheath, but i can tell you they didn't get the same sheath i got. I see NO DIFFERENCE from the sheath i got, from the $10 Case Bowie Sheath for sale. I'd give this 10 ********** stars if i could, i highly recommend it! I purchased one of these a few years ago and it was great for the price. The one I received today was not as good. The knife itself was decent but the sheath I received wasn't real leather like before, and was about a half an inch too short for the knife. The knife had a decent edge on it but it could be better. Overall for the price its not bad, but don't expect to be able to use the sheath.